For other uses, see Bukhara (disambiguation). Bukhara (Uzbek Latin: Buxoro; Uzbek Cyrillic: Бухорo; پارسی : بخارا) is a city in Uzbekistan. Bukhara is rich in historical sites, with about 140 architectural monuments. The nation's fifth-largest city, it had a population of 247,644 as of 31 August 2016[update]. People have inhabited the region around Bukhara for at least five millennia, and the city has existed for half that time. The mother tongue of the majority of people of Bukhara is Tajik. Located on the Silk Road, the city has long served as a center of trade, scholarship, culture, and religion. UNESCO has listed the historic center of Bukhara (which contains numerous mosques and madrasas) as a World Heritage Site. Bukhara was known as Bokhara in 19th- and early-20th-century English publications and as Buhe/Puhe（捕喝) in Tang Chinese. Bukhara has many names. One of its name was Numijkat. It has also been called "Bumiskat". It has 2 names in Arabic. One is "Madinat al Sufriya" meaning—"the copper city" and another is "Madinat Al Tujjar" meaning—"The city of Merchants". But, the name Bukhara is more known than all the other names. In Khorasan, there is no other city with so many names. Since the Middle Ages, the city has been known as Buḫārā / بخارا in Arabic and Persian sources. 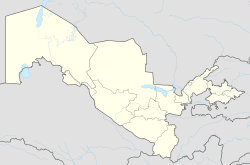 The modern Uzbek spelling is Buxoro. The city's name was mythologized as Albracca in the Italian epic poem Orlando Innamorato published in 1483 by Matteo Maria Boiardo. The history of Bukhara stretches back millennia. It is now the capital of Bukhara Region (viloyat) of Uzbekistan. Located on the Silk Road, the city has long been a center of trade, scholarship, culture, and religion. During the golden age of the Samanids, Bukhara became a major intellectual center of the Islamic world, second only to Baghdad. The historic center of Bukhara, which contains numerous mosques and madrassas, has been listed by UNESCO as a World Heritage Site. Bukhara has been one of the main centres of world civilisation from its early days in 6th century BCE. From the 6th century CE, Turkic speakers gradually moved in. Its architecture and archaeological sites form one of the pillars of Central Asian history and art. The region of Bukhara was a part of the Persian Empire for a long time. The origin of many of its current inhabitants goes back to the period of Aryan immigration into the region. The Samanid Empire seized Bukhara, the capital of Greater Khorasan, in 903 CE. Genghis Khan besieged Bukhara for fifteen days in 1220 CE. As an important trading centre, Bukhara was home to a community of medieval Indian merchants from the city of Multan (modern-day Pakistan) who were noted to own land in the city. Bukhara was the last capital of the Emirate of Bukhara and was besieged by the Red Army during the Russian Civil War. During the Bukhara operation of 1920, an army of well-disciplined and well equipped Red Army troops under the command of Bolshevik general Mikhail Frunze attacked the city of Bukhara. On 31 August 1920, the Emir Alim Khan fled to Dushanbe in Eastern Bukhara (later he escaped from Dushanbe to Kabul in Afghanistan). On 2 September 1920, after four days of fighting, the emir's citadel (the Ark) was destroyed, the red flag was raised from the top of Kalyan Minaret. On 14 September 1920, the All-Bukharan Revolutionary Committee was set up, headed by A. Mukhitdinov. The government—the Council of People's Nazirs (see nāẓir)—was presided over by Faizullah Khojaev. The Bukharan People's Soviet Republic existed from 1920 to 1925 when the city was integrated into the Uzbek Soviet Socialist Republic. Fitzroy Maclean, then a young diplomat in the British Embassy in Moscow, made a surreptitious visit to Bokhara in 1938, sight-seeing and sleeping in parks. In his memoir Eastern Approaches, he judged it an "enchanted city" with buildings that rivalled "the finest architecture of the Italian Renaissance". In the latter half of the 20th century, the war in Afghanistan and civil war in Tajikistan brought Dari- and Tajik-speaking refugees into Bukhara and Samarkand. After integrating themselves into the local Tajik population, these cities face a movement for annexation into Tajikistan with which the cities have no common border. The title Po-i Kalan (also Poi Kalân, Persian پای کلان meaning the "Grand Foundation") belongs to the architectural complex located at the base of the great minaret Kalân. Kalyan minaret. More properly, Minâra-i Kalân, (Persian/Tajik for the "Grand Minaret"). Also known as the Tower of Death, as according to legend it is the site where criminals were executed by being thrown off the top for centuries. The minaret is most famed part of the ensemble, and dominates over historical center of the city. The role of the minaret is largely for traditional and decorative purposes—its dimension exceeds the bounds of the main function of the minaret, which is to provide a vantage point from which the muezzin can call out people to prayer. For this purpose it was enough to ascend to a roof of mosque. This practice was common in initial years of Islam. The word "minaret" derives from the Arabic word "minara" ("lighthouse", or more literally "a place where something burn"). The minarets of the region were possible adaptations of "fire-towers" or lighthouses of previous Zoroastrian eras. The architect, whose name was simply Bako, designed the minaret in the form of a circular-pillar brick tower, narrowing upwards. The diameter of the base is 9 meters (30 feet), while at the top it is 6 m (20 ft). The tower is 45.6 m (150 ft) high, and can be seen from vast distances over the flat plains of Central Asia. There is a brick spiral staircase that twists up inside around the pillar, leading to the landing in sixteen-arched rotunda and skylight, upon which is based a magnificently designed stalactite cornice (or "sharif"). Kalân Mosque (Masjid-i Kalân), arguably completed in 1514, is equal to the Bibi-Khanym Mosque in Samarkand in size. The mosque is able to accommodate twelve thousand people. Although Kalyan Mosque and Bibi-Khanym Mosque of Samarkand are of the same type of building, they are different in terms of art of building. Two hundred and eighty-eight monumental pylons serve as a support for the multi-domed roofing of the galleries encircling the courtyard of Kalyan Mosque. The longitudinal axis of the courtyard ends up with a portal to the main chamber (maksura) with a cruciform hall, topped with a massive blue cupola on a mosaic drum. The edifice keeps many architectural curiosities, for example, a hole in one of domes. Through this hole one can see foundation of Kalyan Minaret. Then moving back step by step, one can count all belts of brickwork of the minaret to the rotunda. Mir-i Arab Madrassah (1535–1536). The construction of Mir-i-Arab Madrasah (Miri Arab Madrasah) is ascribed to Sheikh Abdullah Yamani of Yemen—called Mir-i-Arab—the spiritual mentor of Ubaidullah-khan and his son Abdul-Aziz-khan. Ubaidullah-khan waged permanent successful war with Iran. At least three times his troops seized Herat. Each of such plundering raids on Iran was accompanied by capture of great many captives. They say that Ubaidullah-khan had invested money gained from redemption of more than three thousand Persian captives into construction of Mir-i-Arab Madrasah. Ubaidullah-khan was very religious. He had been nurtured in high respect for Islam in the spirit of Sufism. His father named him in honor of prominent sheikh of the 15th century Ubaidullah al-Ahrar (1404–1490), by origin from Tashkent Region. By the thirties of the 16th century the time, when sovereigns erected splendid mausoleums for themselves and for their relatives, was over. Khans of Shaibanid dynasty were standard-bearers of Koran traditions. The significance of religion was so great that even such famed khan as Ubaidullah was conveyed to earth close by his mentor in his madrasah. In the middle of the vault (gurhana) in Mir-i-Arab Madrasah is situated the wooden tomb of Ubaidullah-khan. At his head is wrapped in the moulds his mentor, Mir-i-Arab. Muhammad Kasim, mudarris (a senior teacher) of the madrasah (died in 1047 hijra) is also interred near by here. The portal of Miri Arab Madrasah is situated on one axis with the portal of the Kalyan Mosque. However, because of some lowering of the square to the east it was necessary to raise a little an edifice of the madrasah on a platform. The Lab-i Hauz (or Lab-e hauz, Persian: لب حوض, meaning by the pond) Ensemble (1568–1622) is the name of the area surrounding one of the few remaining hauz, or pond, in the city of Bukhara. Several such ponds existed in Bukhara prior to Soviet rule. The ponds acted as the city's principal source of water, but were also notorious for spreading disease, and thus were mostly filled in during the 1920s and 1930s by the Soviets. The Lab-i Hauz survived owing to its role as the centerpiece of an architectural ensemble dating back to the 16th to 17th centuries. The Lab-i Hauz ensemble consists of the 16th-century Kukeldash Madrasah, the largest in the city, along the north side of the pond. On the eastern and western sides of the pond are a 17th-century lodging-house for itinerant Sufis, and a 17th-century madrasah. There is also a metal sculpture of Nasruddin Hodja, the quick-witted and warm-hearted man, who forms the central character of many children's folk stories in Central Asian, Afghanistan, and Pakistan, sitting atop his mule with one hand on his heart and the other with an 'All OK' sign above his head. Bahoutdin Architectural Complex is a necropolis commemorating Shaykh Baha-ud-Din or Bohoutdin, the founder of Naqshbandi order. The complex includes the dahma (gravestone) of Bahoutdin, Khakim Kushbegi mosque, Muzaffarkan mosque, and Abdul-Lazizkhan khanqah. The site is listed on the UNESCO World Heritage Site tentative list on January 18, 2008. Chashma-Ayub, or Job's spring, is located near the Samani mausoleum. Its name is said to reflect a legend that states the prophet Job ("Ayub" in the Quran) visited this place and brought forth a spring of water by the blow of his staff on the ground. The water of this well is said to be exceptionally pure, and is regarded for its supposed "healing qualities." The current edifice at the site was constructed during the reign of Timur, and features a Khwarazm-style conical dome that is otherwise uncommon in the region. The Ismail Samani mausoleum (9th–10th centuries), is one of the most highly esteemed work of Central Asian architecture. It was built in the 9th century (between 892 and 943) as the resting-place of Ismail Samani—the founder of the Samanid dynasty, which was the last native Persian dynasty to rule the region in the 9th to 10th centuries, after the Samanids established virtual independence from the Abbasid Caliphate in Baghdad. The site is unique for its architectural style which combines both Zoroastrian and Islamic motifs. The building's facade is covered in intricately decorated brick work, which features circular patterns reminiscent of the sun—a common image in Zoroastrian art from the region at that time which is reminiscent of the Zoroastrian god, Ahura Mazda, who is typically represented by fire and light. The building's shape is cuboid, and reminiscent of the Ka'aba in Makkah, while the domed roof is a typical feature of mosque architecture. The syncretic style of the shrine is reflective of the 9th to 10th centuries—a time when the region still had large populations of Zoroastrians who had begun to convert to Islam around that time. The shrine is also regarded as one of the oldest monuments in the Bukhara region. At the time of Genghis Khan's invasion, the shrine was said to have already been buried in mud from flooding. Thus, when the Mongol hordes reached Bukhara, the shrine was spared from their destruction. The mausoleum of Pakistan's founding father, Muhammad Ali Jinnah, known as the Mazar-e-Quaid in Karachi, was modeled after the shrine. Built in 1712, on the opposite side of the citadel of Ark in Registan district, Bolo Haouz Mosque is inscribed in the UNESCO World Heritage Site list along with the other parts of the historic city. It served as a Friday mosque during the time when the emir of Bukhara was being subjugated under the Bolshevik Russian rule in 1920s. Char Minor (alternatively spelled Chor Minor, and also alternatively known as the Madrasah of Khalif Niyaz-kul) is a building tucked away in a lane northeast of the Lyabi Hauz complex. The structure was built by Khalif Niyaz-kul, a wealthy Bukharan of Turkmen origin in the 19th century under the rule of the Janid dynasty. The four-towered structure is sometimes mistaken for a gate to the madras that once existed behind the structure; however, the Char-Minar is actually a complex of buildings with two functions, ritual and shelter. The main edifice is a mosque. In spite of its unusual outward shape, the building has a typical interior for a Central Asian mosque. Owing to the buildings cupola, the room has good acoustic properties and therefore takes on special significance of 'dhikr-hana'—a place for ritualized 'dhikr' ceremonies of Sufi, the liturgy of which often include recitation, singing, and instrumental music. On either side of the central edifice are located dwelling rooms, some of which have collapsed, leaving only their foundations visible. Consequently, for full functioning of madrasah only of classroom and some utility rooms is lacking. However, it was common practice that so-called madrasahs had no lecture rooms or, even if they had, no lectures had been given in them. These madrasahs were employed as student hospices. Each of the four towers has different decorational motifs. Some say that elements of decoration reflect the four religions known to Central Asians. One can find elements reminiscent of a cross, a Christian fish motif, and a Buddhist praying-wheel, in addition to Zoroastrian and Islamic motifs. In 1995, due to an underground brook, one of the four towers collapsed  and emergency assistance was applied for and granted by UNESCO under the World Heritage Fund. Although the collapse resulted in destabilizing the entire structure, the authorities were anxious to keep awareness of the disaster to a minimum. Without explanation the building disappeared from the list of sights and after hurried reconstruction of the tower "using non-traditional building material, such as poor quality cement and steel" Char Minar returned as one of the most popular sights of the city, yet the event has been kept secret ever since. On the esplanade to the right from Char-Minar is a pool, likely of the same age as the rest of the building complex. Char Minar is now surrounded mainly by small houses and shops along its perimeter. The former Magoki Attori mosque was constructed in the 9th century on the remains of what may have been an older Zoroastrian temple. The mosque was destroyed and rebuilt more than once, and the oldest part now remaining is the south façade, which dates from the 12th century—making it one of the oldest surviving structures in Bukhara, and one of few which survived the onslaught of Genghis Khan. Lower than the surrounding ground level, the mosque was excavated in 1935. It no longer functions as a mosque, but, rather, houses a carpet museum. In Bukhara there is a mosque which is said to be that of Mir Sayyid Ali Hamadani, the patron saint of Kashmiri Muslims in the Valley of Kashmir. Bukhara International Airport has regularly scheduled flights to cities in Uzbekistan and Russia. The Turkmenistan border is about 80 km away with the nearest city there being Türkmenabat, connected via the M37 highway which continues to other places in Turkmenistan including Ashgabat. The city is also served by railroad links with the rest of Uzbekistan, and is a hub for roadways leading to all major cities in Uzbekistan and beyond, including Mazar-i-Sharif in Afghanistan via the M39 highway. The city of Samarkand is 215 km to the east of Bukhara. According to the official statistics, the city's population is 82% Uzbeks, 6% Russians, 4% Tajiks, 3% Tatars, 1% Koreans, 1% Turkmens, 1% Ukrainians, 2% of other ethnicities. However, official Uzbek numbers have for long been criticized and refuted by various observers and Western sources and it is widely assumed that the population of the city consists mainly of Tajik-speaking Tajiks, with ethnic Uzbeks forming a growing minority. Exact figures are difficult to evaluate, since many people in Uzbekistan either identify as "Uzbek" even though they speak Tajik as their first language, or because they are registered as Uzbeks by the central government despite their Tajik language and identity. According to Soviet estimates in the early 20th century (based on numbers from 1913 and 1917), the Tajiks formed the overwhelming majority of city. Until the 20th century, Bukhara was also home to the Bukharan Jews, whose language (Bukhori) is a dialect of Tajiki. Their ancestors settled in the city during Roman times. Most Bukharan Jews left the city between 1925 and 2000 and settled in Israel and the United States. Ali-Akbar Dehkhoda defines the name Bukhara itself as meaning "full of knowledge", referring to the fact that in antiquity, Bukhara was a scientific and scholarship powerhouse. In the Italian romantic epic Orlando innamorato by Matteo Maria Boiardo, Bukhara is called Albracca and described as a major city of Cathay. There, within its walled city and fortress, Angelica and the knights she has befriended make their stand when attacked by Agrican, emperor of Tartary. As described, this siege by Agrican resembles the historic siege by Genghis Khan in 1220. Sadiduddin Muhammad Aufi (1171–1242) historian, scientist, and author. ^ "Uzbekistan - Largest Cities". GeoNames. GeoNames. Retrieved 31 August 2016. ^ Rahim Masov, The History of the Clumsy Delimitation, Irfon Publ. House, Dushanbe, 1991 (in Russian). English translation: The History of a National Catastrophe, transl. Iraj Bashiri, 1996. ^ "21 World Heritage Sites you have probably never heard of". Daily Telegraph. ^ "UMID" Foundation, Uzbekistan. "General Info". Archived from the original on 2001-01-26. Retrieved 2007-10-04. ^ Richard N Frye, 'Bukhara i. In pre-Islamic times' Archived January 2, 2009, at the Wayback Machine, Encyclopædia Iranica, 512. ^ "Information about Bukhara". Retrieved 2013-05-01. ^ Sen, Sailendra (2013). A Textbook of Medieval Indian History. Primus Books. p. 62. ISBN 978-9-38060-734-4. ^ Battutah, Ibn (2002). The Travels of Ibn Battutah. London: Picador. pp. 141, 313. ISBN 9780330418799. ^ Levi, Scott (2016). "Caravans: Punjabi Khatri Merchants on the Silk Road". Penguin UK. Retrieved 12 April 2017. ^ Sengupta, Anita (2003). The Formation of the Uzbek Nation-State: A Study in Transition. Lexington Books. pp. 256–257. ^ Dmitriy Page. "Kalyan Minaret". Retrieved October 14, 2014. ^ "В.Г. Сааков Архитектурные шедевры Бухары. Бухарское областное общество "Китабхон" Уз ССР, Ровно 1991 г. ^ Dmitriy Page. "Mir-i-Arab". Retrieved October 20, 2014. ^ Dmitriy Page. "Kukeldash Madrasah". Retrieved 2007-10-04. ^ Dmitriy Page. "Nadir Divan-Begi Khanaka". Retrieved 2007-10-04. ^ Dmitriy Page. "Nadir Divan-Begi Madrasah". Retrieved 2007-10-04. ^ "Viloyat haqida - Shahar va tumanlar (About the province - Cities and districts)" (in Uzbek). Buxoro Region administration. Retrieved March 4, 2014. ^ Karl Cordell: Ethnicity and Democratisation in the New Europe, Routledge, 1998. Pg. 201: "… Consequently, the number of citizens who regard themselves as Tajiks is difficult to determine. […] Samarkand State University (SamGU) academic and international commentators suggest that there may be between six and seven million Tajiks in Uzbekistan, constituting 30% of the republic's 22 million population, rather than the official figure of 4.7% (Foltz 1996;213; Carlisle 1995:88)…"
^ a b Paul Bergne: The Birth of Tajikistan. National Identity and the Origins of the Republic. International Library of Central Asia Studies. I.B. Tauris. 2007. Pg. 8 ff. Gibb, H. A. R. (1923). The Arab Conquests in Central Asia. London: The Royal Asiatic Society. OCLC 685253133. Shaban, M. A. (1979). The 'Abbāsid Revolution. Cambridge: Cambridge University Press. ISBN 0-521-29534-3. Bosworth, C.E. (1986). "Ḳutayba b. Muslim". The Encyclopedia of Islam, New Edition, Volume V: Khe–Mahi. Leiden and New York: BRILL. pp. 541–542. ISBN 90-04-07819-3. B. A. Litvinsky, Ahmad Hasan Dani (1996). History of Civilizations of Central Asia: The crossroads of civilizations, A.D. 250 to 750. UNESCO. pp. 1–569. ISBN 9789231032110. Moorcroft, W. and Trebeck, G. (1841). Travels in the Himalayan Provinces of Hindustan and the Panjab; in Ladakh and Kashmir, in Peshawar, Kabul, Kunduz, and Bokhara... from 1819 to 1825, Vol. II. Reprint: New Delhi, Sagar Publications, 1971. Wikimedia Commons has media related to Bukhara. Wikivoyage has a travel guide for Bukhara. Wikisource has the text of The New Student's Reference Work article "Bokhara". Through the Lens—the Silk Road Then and Now -A century of change is captured in photos of a fabled Central Asian oasis. Forbes, Andrew, & Henley, David: Timur's Legacy: The Architecture of Bukhara and Samarkand (CPA Media). Chisholm, Hugh, ed. (1911). "Bokhara" . Encyclopædia Britannica. 4 (11th ed.). Cambridge University Press. pp. 157–158. Samarkand, alternatively Samarqand, is a city in modern-day Uzbekistan, and is one of the oldest continuously inhabited cities in Central Asia. There is evidence of human activity in the area of the city from the late Paleolithic era, though there is no direct evidence of when Samarkand was founded; some theories propose that it was founded between the 8th and 7th centuries BC. Prospering from its location on the Silk Road between China and the Mediterranean, at times Samarkand was one of the greatest cities of Central Asia. The Registan was the heart of the ancient city of Samarkand of the Timurid dynasty, now in Uzbekistan. The name Rēgistan (ریگستان) means "Sandy place" or "desert" in Persian. The Gūr-i Amīr or Guri Amir is a mausoleum of the Asian conqueror Timur in Samarkand, Uzbekistan. It occupies an important place in the history of Persian-Mongolian Architecture as the precursor and model for later great Mughal architecture tombs, including Gardens of Babur in Kabul, Humayun's Tomb in Delhi and the Taj Mahal in Agra, built by Timur's Persianised descendants, the ruling Mughal dynasty of Indian Subcontinent. It has been heavily restored. Shakhrisabz, is a city in Qashqadaryo Region in southern Uzbekistan located approximately 80 km south of Samarkand with a population of 100,300 (2014). It is located at an altitude of 622 m. Historically known as Kesh or Kish, Shahrisabz was once a major city of Central Asia and was an important urban center of Sogdiana. It is primarily known today as the birthplace of 14th-century Turco-Mongol conqueror Timur. The Khanate of Kokand was an Uzbek state in Fergana Valley, Central Asia that existed from 1709–1876 within the territory of eastern Uzbekistan, modern Kyrgyzstan, eastern Tajikistan and southeastern Kazakhstan. The name of the city and the khanate may also be spelled as Khoqand in modern scholarly literature. The Emirate of Bukhara was an Uzbek state that existed from 1785 to 1920 in what is now modern-day Uzbekistan. It occupied the land between the Amu Darya and Syr Darya rivers, known formerly as Transoxiana. Its core territory was the land along the lower Zarafshan River, and its urban centres were the ancient cities of Samarkand and the emirate's capital, Bukhara. It was contemporaneous with the Khanate of Khiva to the west, in Khwarezm, and the Khanate of Kokand to the east, in Fergana. The Khanate of Bukhara was an Uzbek state from the second quarter of the 16th century to the late 18th century in Central Asia. Bukhara became the capital of the short-lived Shaybanid empire during the reign of Ubaydallah Khan (1533–1540). The khanate reached its greatest extent and influence under its penultimate Shaybanid ruler, the scholarly Abdullah Khan II. Emir Said Mir Mohammed Alim Khan was the last emir representative of the Uzbek Manghit Dynasty, the last ruling dynasty of the Emirate of Bukhara in Central Asia. Although Bukhara was a protectorate of the Russian Empire from 1873, the Emir presided over the internal affairs of his emirate as an absolute monarch. Mohammed reigned from 3 January 1911 to 30 August 1920 and was the last descendent of Genghis Khan to rule over a part of what was the Mongol Empire. The mosque Bibi-Khanym Mosque is one of the most important monuments of Samarkand. In the 15th century it was one of the largest and most magnificent mosques in the Islamic world. By the mid-20th century only a grandiose ruin of it still survived, but major parts of the mosque were restored during the Soviet period. Lyab-i Hauz, or Lyab-i Khauz, is the name of the area surrounding one of the few remaining hauz (ponds) that have survived in the city of Bukhara. Until the Soviet period there were many such ponds, which were the city's principal source of water, but they were notorious for spreading disease and were mostly filled in during the 1920s and 1930s. The Lyab-i Hauz survived because it is the centrepiece of a magnificent architectural ensemble, created during the 16th and 17th centuries, which has not been significantly changed since. The Lyab-i Hauz ensemble, surrounding the pond on three sides, consists of the Kukeldash Madrasah (1568-1569) (the largest in the city, and of two religious edifices built by Nadir Divan-Beghi: a khanaka and a madrasah (that stand on the west and east sides of the pond respectively. The small Qazi-e Kalyan Nasreddin madrasah was formerly located beside the Kukeldash madrasah. Po-i-Kalan or Poi Kalan, is an Islamic religious complex located around the Kalan minaret in Bukhara, Uzbekistan. The Kalyan minaret is a minaret of the Po-i-Kalyan mosque complex in Bukhara, Uzbekistan and one of the most prominent landmarks in the city. The Bukharan People's Soviet Republic was a short-lived Soviet state that governed the former Emirate of Bukhara during the years immediately following the Russian Revolution. In 1924, its name was changed to the Bukharan Socialist Soviet Republic. After the redrawing of regional borders, its territory was assigned mostly to the Uzbek SSR and some to the Turkmen SSR. The architecture of Uzbekistan is noted for its originality. Many consider Uzbekistan's architecture to be notable despite the changing economic conditions, technological advances, demographic fluctuations, and cultural shifts that the country has experienced. Chor Minor, alternatively known as the Madrasah of Khalif Niyaz-kul, is a historic gatehouse for a now-destroyed madrasa in the historic city of Bukhara, Uzbekistan. It is located in a lane northeast of the Lyab-i Hauz complex. It is protected as a cultural heritage monument, and also it is a part of the World Heritage Site Historic Centre of Bukhara. In Persian, the name of the monument means "Four minarets", and the building indeed has four towers. Magok-i-Attari Mosque is a historical mosque in Bukhara, Uzbekistan. It is forming a part of historical religious complex of Lyab-i Hauz. The mosque is located in the historical center of Bukhara, about 300 meters southwest of Po-i-Kalyan, 100 meters southwest of the Toqi Telpak Furushon trading dome and 100 meters east of Lyab-i Hauz. It is a part of UNESCO World Heritage Site Historic Centre of Bukhara. Today, the mosque is used as a carpet museum.